Dalhousie Medical school has some longstanding and very unique traditions and events that are held annually and throughout the year. These events provide a unique opportunity for students from all four years to get together as well as many faculty and staff. Please read below to learn all about the fun Dalhousie Medical students have outside of the classroom! This annual event is a great opportunity for students from all four classes to come together and enjoy a formal meal and an evening of entertainment. This banquet also provides the opportunity for student awards to be presented to students in recognition of a variety of achievements ranging from outstanding intramural participation to leadership within their class and the school as a whole. Professors are also recognized for teaching excellence. This event is always highly anticipated and well attended. 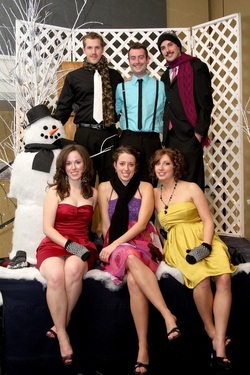 This ball and banquet is a tradition that has existed at Dalhousie Medical School for over 100 years! Euphoria is one of the most unique traditions at Dalhousie Medical School. It is an annual variety show in which each class prepares a 30 minute show which includes the many and far reaching talents of our medical students. In preparation for this event each class is shrouded in secrecy and competes against the other classes for the best show. Talents are far reaching and include singing, dancing, videos and just about anything and everything else you can think of. This event is sold out every year and all proceeds go to charity, with a different charity being selected every year. The Euphoria trophy is a highly coveted prize and competition is fierce. This event has been going on for over 40 years and is absolutely not to be missed! This annual event includes both a silent and a live auction. The live auction items include dinners, golf, sailing and other activities with or donated by physicians and faculty. There are also many items donated by local businesses. This event is always a lot fun and a great way for students to come together and raise money for a new charity every year! This is a speaker series where physicians from different specialties come in and talk to students in an informal setting about what it is like to work in their respective specialty. This is a great opportunity for students to ask questions about career choices, work-life balance, residency and just about anything else. These great sessions are made possible by the generous support of Student Affairs. Other events that the Dalhousie Medical Student Society organizes include a food drive which raises money for Feed Nova Scotia.